The Sensor Chip in the electrode head stores sensor data and sends it to the titrator setup when plugged in. This assures that the correct sensor and sensor data are used without requiring any user interaction. 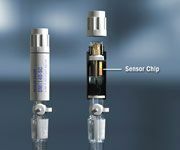 The new Plug & Play titration electrodes contain the Sensor Chip in the electrode head that stores all relevant data of the pH and metal titration electrodes. 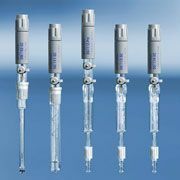 As soon as the Plug & Play sensor is connected to the Excellence titrator, it is automatically recognized and ready for use. Electrode type, serial number, calibration data and validity period as well as working life stored in he Sensor Chip are automatically read-in by the titrator. Errors are minimized, mix-ups are a thing of the past and complete traceability according to 21 CFR part 11 is ensured if LabX titration 2.6 is used. The new Plug & Play sensors feature a S12 head containing the Sensor Chip. The new electrode head is longer than the classical S7 head. The sensors are labeled as DGi (pH glass) or DMi (platinum or silver ring) in prominent blue letters. In order to use the complete functionality of a Plug & Play sensor a modified connection cable is required. The new cables are labeled with a blue ring in order to indicate the enhanced functionality with respect to the support of the Plug & Play sensors and are fully backward compatible to classic sensors.